The New Zealand dollar has everything going for it – high interest rates, a booming economy, elevated construction activity – except the wants and expectations of the New Zealand central bank, and by extension the sentiment of the Forex market. Since the remarks by RBNZ governor Graeme Wheeler last week, which were designed to send a shot across the bows of market participants who had been sending the New Zealand currency unit inexorably higher on the back of further interest rate rise expectations, and which hinted at market intervention if such has not already occurred, NZDUSD has fallen precipitately. Now there is a general feeling in the market place that the US dollar is set for a period of growth. Once again, it is interest rate expectations that are at the back of this. Quantitative Easing (QE) in the US is due to be ended in October. Any shortening of expectations for the time to be taken between that and the introduction of rate rises stateside will cause the Greenback to strengthen. 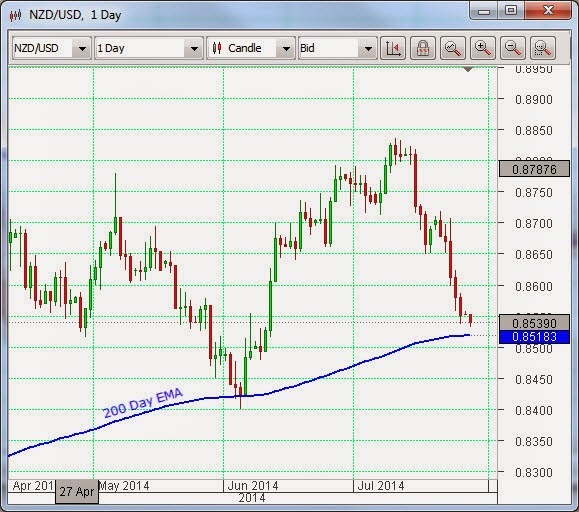 This could push the Kiwi / US dollar pair even lower. And this is set to be a big week for the US dollar, when indications around just that question will be keenly sought. On Wednesday we have the ADP payroll figures, which are watched as a leading indicator of what the critical US Non-Farm Payrolls report will tell us on Friday. Wednesday also has Gross Domestic Product (GDP) outcome Year-on-year, and on the same day the Federal Open Market Committee (FOMC) interest rate decision and Monetary Policy Statement. Rates are not expected to change on this occasion, but the Monetary Policy Statement will be closely examined. Any of these has the potential to excite the market, and all of them together can be expected to lead to some possible fireworks.